For the last two years I’ve watched other bloggers take the Me Made May pledge, and followed through the month as they’ve rocked their handmade wardrobe in a really public way (so many people post daily outfit pictures during the month, which feels like a more public way to dress than just to wear your clothes and go about your day). Last year I really wanted to join in, but I knew I didn’t have the wardrobe to do so; this year I think I’m right on the cusp. 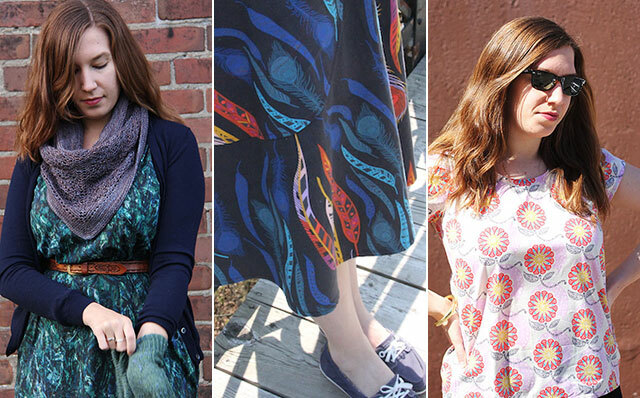 I have a few skirts, a few tops, one lightweight cardigan, a dress, and some accessories. I’m not sure it’s really enough to get my through the whole month, but I’m going to try (and I plan to add to the tally as I go along). Technically, I think I’m too late to make the official pledge, but I don’t care. Having a largely handmade wardrobe is a slow process, so maybe deciding to pledge can also be slow. I want to make this month as thoughtful and useful as possible, so I took my time thinking about what I wanted to get out of it, and here’s what I’ve come up with. First, I want to really assess my handmade wardrobe. It’s small, so there are lots of holes, but I want to get a real sense of what works and what doesn’t, so I know what to add going forward. I also want to be really aware of what I’ve made so far, how those garments fit, and how they make me feel, because I don’t want to spend time making things unless those things are going to make me feel great later. I, Angela, am signing up for Me Made May 2015 with the goal of building an outfit around something Me-Made 5 days a week (this means a pair of socks won’t cut it, but a great shawl might). I will endeavour to post a photo each day on Instagram. 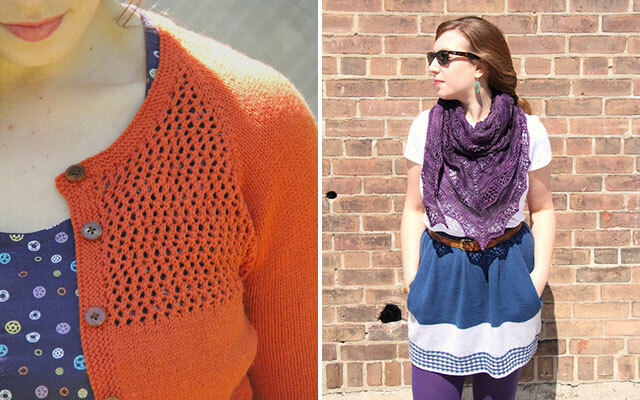 Left to right: My one and only successful Wiksten Tank, with Grace; and my Shaelyn shawl with New Girl. I am surprisingly excited about this challenge, especially since L and I are going away for 10 days and I have no idea how a me-made wardrobe will work for our trip (about which, more later). I’m not going to do weekly roundups, but I will do a sum-up post at the end of the month. Is anyone else doing Me Made May this year? What do you think of this whole thing? (Honestly, as a knitter, I think Me Made March would be way easier to commit to). That was always my problem too. I’ve been slowly increasing my sewing output (and skill), so I think I’m finally ready. In the winter though, this challenge would be a piece of cake! This is a terrific goal to have. I don’t know how to sew unfortunately and right now our family is in slow transition. I will have fun watching your progress. I totally understand! Thinking about this challenge has made me very aware of how seasonal my knitwear is, which is crazy because I knit year-round! I’m going to try and knit at least one linen top this year, but I definitely need more.